Just when you think that you have seen all kinds of things sold on eBay, well you haven’t seen something as bizarre as a soul for sale. 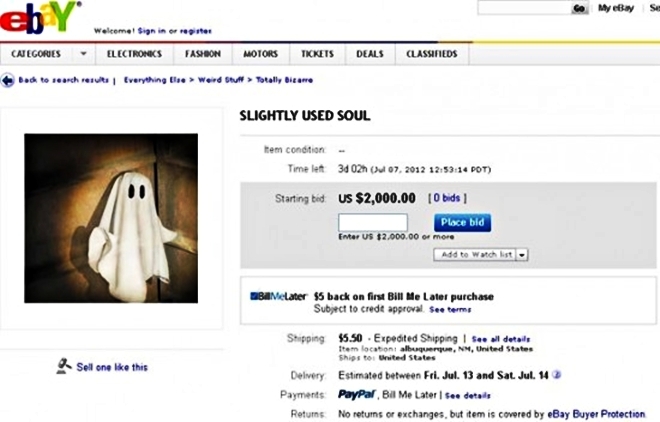 Lori N, a woman from Albuquerque tried selling her “slightly used soul” with an opening bid of $2,000. Her eBay ad seems to be her cry for help. Lori, apparently has been through tough times in her life. Around five years ago, when her life seems to be fine, a car she was a passenger of was hit by a drunk driver. She was in a comatose state for three weeks and woke up with a stroke, a broken hip, broken pelvis, leg, collarbone, sternum, ribs, a collapsed lung and unfortunately, she also lost one of her breasts. She also is not earning enough to support herself with her part-time inventory work and jewelry making. She used to be a freelance writer but is having a hard time coming up with ideas to get the job done. No one has tried bidding for her soul, as of this moment. But she is happy that her ad has gotten a lot of attention from people.